My good friend Melissa from Melly Sews is a fellow Austinite. You might have seen me talk about her a few times. 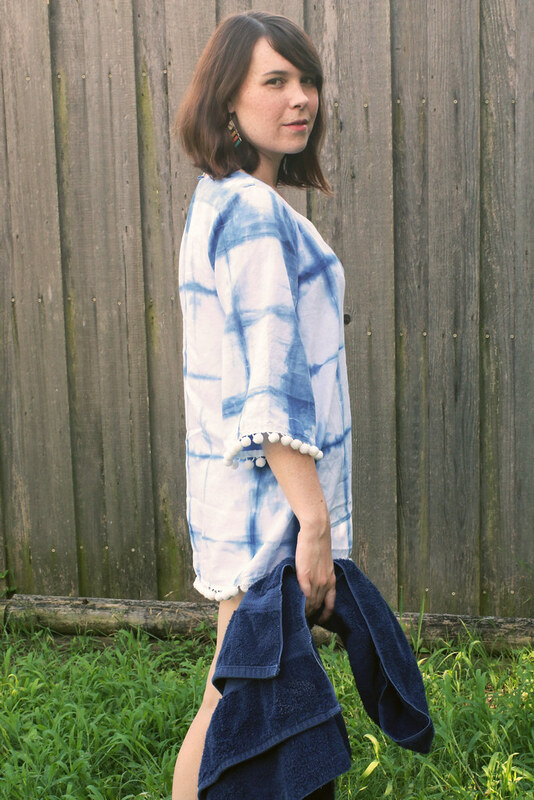 Like last year I decided to join her month long celebration of summer-y dresses but this time I wanted to mix it up so I made a fun beach cover up. And as my upcoming island vacation is not for another couple of months I’m afraid my backyard fence will have to stand in for white capped waves and beach umbrellas. I was inspired by the tunic-style simple dresses I’ve seen. I also liked long sleeves because I hate to get sunburned. It rather short, and the front slit rather deep so no one would mistake this for a real dress. It’s very much a walk-from-the-beach-to-the-resort-lobby kind of garment. I like the breezy look of white fabric but I wanted an extra bit of flare so I decided to dye my fabric. Oh, and pom poms! ‘Cause when else do you really get to flaunt some chunky pom poms on your clothes? – About 2-3 yds of natural fiber white fabric. I used a linen/cotton blend. – About 3 yds of big pom pom trim. – A bucket or large container WITH A LID. Plus another bucket or bowl for water to soak your fabric. – A dowel rod or something that can be used to stir the dye – NOT a food utensil. 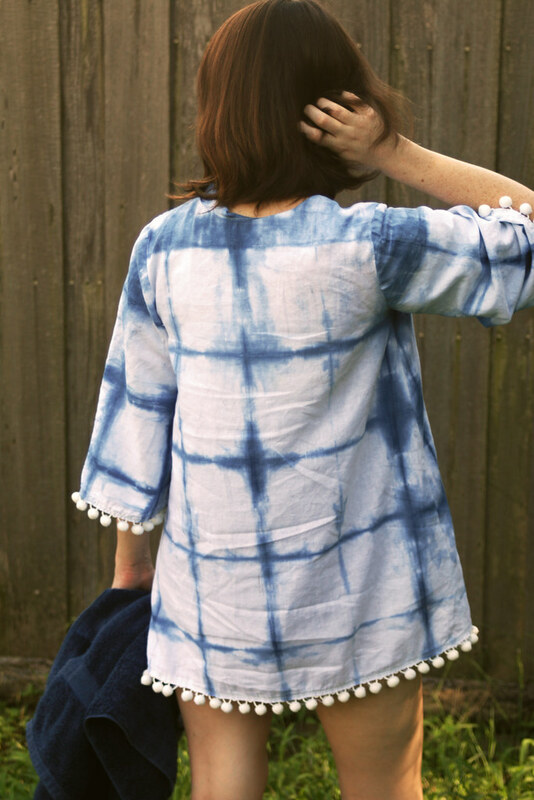 – An indigo dye kit (I used this one, which has all the materials you need) or your own dye. – A plain t-shirt or woven bodice sewing pattern with sleeves. I’m using Grainline’s Scout Tee because it doesn’t have any darts and I am too lazy for darts. I dyed my fabric prior to cutting out the pieces just in case I messed up. I did cut down my fabric into two smaller sections so that it would be easier to fold and handle. Following the kit directions I went outside and put 4 gallons of warm water to my plastic box. Then I poured in the indigo dye. It quickly starts to change color once it hits the water. Neat looking, right? After that I added the reducing agents and mixed. The key to indigo dying is to not introduce oxygen in the dye so you always need to stir very slowly without splashing and cover the dye container in between uses. Oxygen “sets” the dye so if too much gets in the dye vat it won’t work. Stir the mixture gently and let sit, covered, for about half an hour or until the liquid itself turns a lime green color and the top of the vat has a layer of darker blue on top (called “flower” or “bloom”). It kind of works like a protective barrier to keep oxygen out. Prepare your fabric by folding it up. For my square pattern I folded it accordion style down one direction then the other making a nice little stack of fabric. The kit comes with a booklet of patterns to try. Then I placed the two wooded boards included in the kit on either side and secured them with rubber bands (also in the kit). I soaked the fabric in water and squeezed out excess air and fluid and transferred it to the dye vat. You’ll need gloves for this part, obviously. Push the flower aside and carefully dip the fabric in the vat. Don’t let it hit the bottom as sediment can collect down there. I kept my fabric submerged for only 2 min or so but you can keep yours in longer. Then take it out and set it aside. It will look lime green but after exposing the newly dyed fabric to air it will begin to turn blue. The fabric looks darker while wet. When you’re finished you can keep the vat covered and it will last for about a day just in case you decide to go dye-happy and find every white shirt and pillowcase in your house and dunk it in there. After the fabric has dried, gently wash and iron it. I took the front and back pieces of my scout tee and aligned on the fold of my fabric. Then, with my ruler I extended the center front line down from the neckline to my new hem (Measurement 1). I next extended my side seam down and slightly outward from the underarm point and drew a gently curved line connecting my new center front and side seams at the hem. I made the sleeves longer by doing something similar – extending the seam lines down and out to give the sleeve a bit of a “bell” shape, and adding a slightly curved hem (Measurement 2). For the neckline you have a few options. You can simply bind it with bias tape or you could make a facing with a neckline slit like I did by copying the neckline curve from the original front and back pattern pieces. Almost finished! From here I put together the pieces like normal. Add interfacing if you like to the facing pieces. Sew the dress front and back at the shoulders. Sew the facings at the shoulders. Finish the raw outer edges of the facings. Right sides together, sew the facing around the neckline. When you reach the front slit, stop, pivot, and continue down to your slit end point. Pivot and continue back up making a narrow “V” shape. Pivot again back at the top and continue around to the end. From here you can cut the slit. 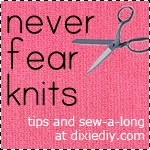 Be very careful not to cut through the stitches. Clip the corners. You can undersitch the seam allowances to the facing if you’d like. For the sleeve and dress hems I folded the raw edges inward 1/4″, slipped the pom pom tape inside so it is covered by the folded fabric (and you only see the poms from the outside) and zig zagged around the the edge. Melly Sews is also hosting weekly giveaways celebrating 30 Days of Sundresses. This week you have the chance to win one three detailed and informative online pattern drafting classes (Melissa has her own pattern company so she has a lot of experience in that department). You can click here to enter.